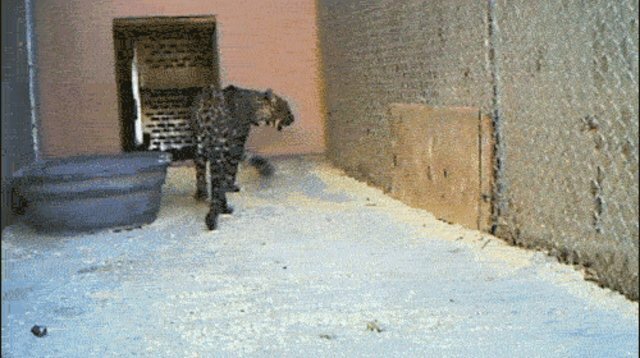 When Linda Searles witnessed Leonardo, a jaguar and African leopard mix, take his first steps on grass, she almost cried. 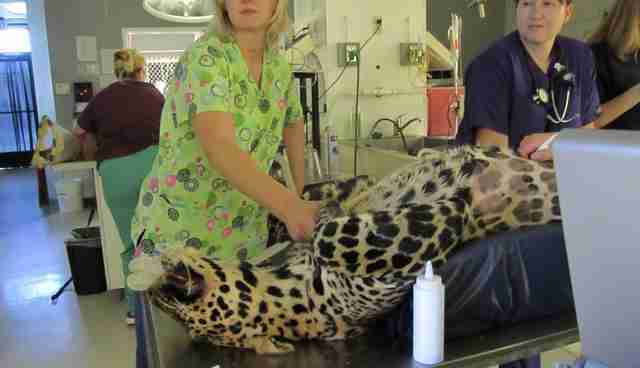 "He was very excited," Searles, founder and director of Southwest Wildlife Conservation Center, told The Dodo. "He never had grass before." Leonardo was born and bred in Las Vegas for the entertainment industry. 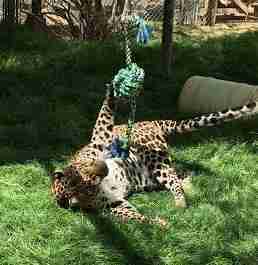 Declawed on all his paws and defanged, he spent his entire life in a cage prior to arriving at Southwest Wildlife. "He would touch [the grass] and pull his paw back as if to say, 'What is this? It's different,'" Searles said. "He would lay down and roll in it, and take a taste of it. Then he'd figure it out, and start to run and bounce around on it." Founded by Searles in 1994 on 10 acres in Scottsdale, Arizona, Southwest Wildlife cares for roughly 300 animals, depending on the time of year, according to Kelly Marcum, the center's education director. "About 70 percent of the animals that are rehabbed are put back in the wild," Marcum told The Dodo. 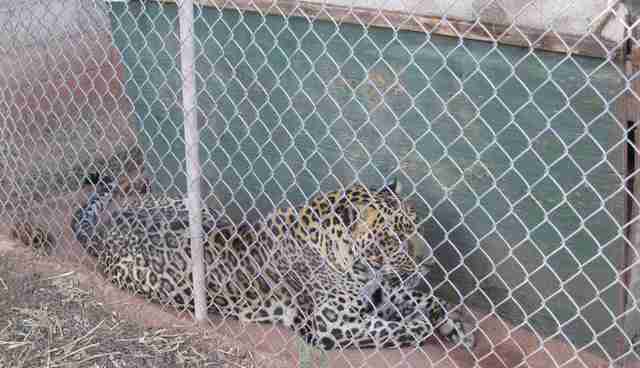 Animals that cannot be returned to the wild either remain at the center for the rest of their lives or are placed at other accredited sanctuaries. Originally Leonardo was used in a magic show, and then he was sold a few years later to a roadside zoo on the Arizona-Mexico border. Searles received calls from the public for years about Leonardo asking if something could be done. 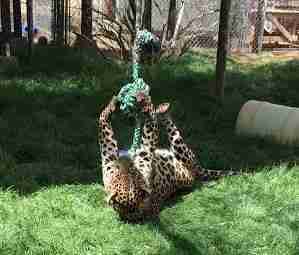 She called the U.S. Department of Agriculture (USDA) and was told they couldn't do anything because the zoo was licensed, meaning the zoo was legally allowed to keep the animal. 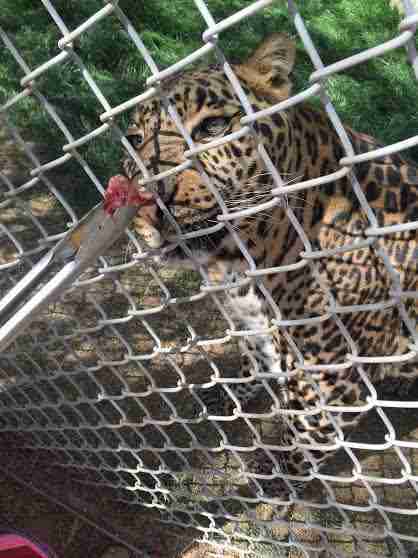 "I kind of gave up on it, but told the USDA that if that place gets closed down, I'll help you place the animals and will take the cat," Searles said. That day finally came in 2013. She helped find placement for the primates through the American Sanctuary Association (ASA). The USDA told Searles that Leonardo might not make it because he was in such bad shape, so Searles and a team of volunteers drove five hours to pick him up. He was sedated and placed in a large locking steel crate with ventilation holes for transport. "He was almost dead," Searles said. Leonardo was malnourished and had a bad case of pneumonia. "He could only get up and walk a few steps before he'd fall down." "We hoped for the best," Searles said. He slowly improved over time with a better diet and medication. Unsurprisingly, Leonardo was not a big fan of people after his previous encounters with them. "He would charge the fence and spit at you," Searles said. "He couldn't charge it hard though because he couldn't walk." Searles was determined to gain his trust. "I went back in the evenings and sat outside of his cage with my back to him and let him smell me, and he would growl," Searles said. "One night he came over and laid down with his back to me, and that was our first breakthrough where he started to trust." That happened about six months after Leonardo arrived. After the first year, he really started to come around. "Over a period of time he has grown to love us and be happy," Searles said. Since Leonardo is in sanctuary in his enclosure, it is important to enrich his life, so Searles and volunteers provide toys, cardboard boxes full of shredded newspaper and a treat. Leonardo used to hide when people were around, but now he comes outside to check out his surroundings, in particular the horses, chickens and burros next to his enclosure, which is carpeted with thick, green grass. Leonardo has his favorite people as well - Searles and a volunteer named Lynn. "When I walk down to the barn he'll call to me, so I'll walk over and spend time with him," Searles said. "He sits and rubs on the fence. If I put both my hands outside of the chain-link, he'll stand and put his paws on top of mine." Leonardo loves attention. He is playful and has a funny sense of humor. 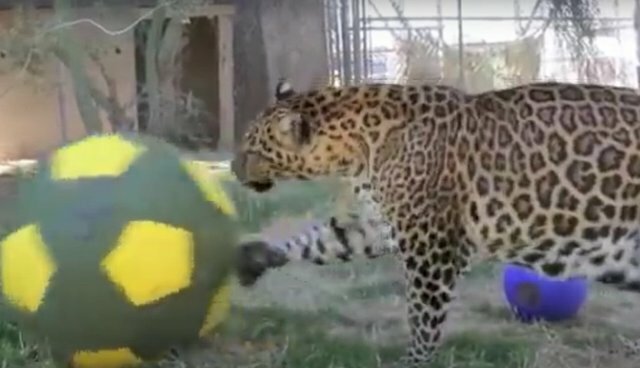 Although a big cat, he can act very much like his more domestic brethren, and he will run and grab his ball to catch people's attention. "He stops to look and see if you're watching," Searles said. His former life is a window into the animal entertainment industry. "I would like people to think, when they buy tickets to those shows, to think about how those animals live," Searles said. 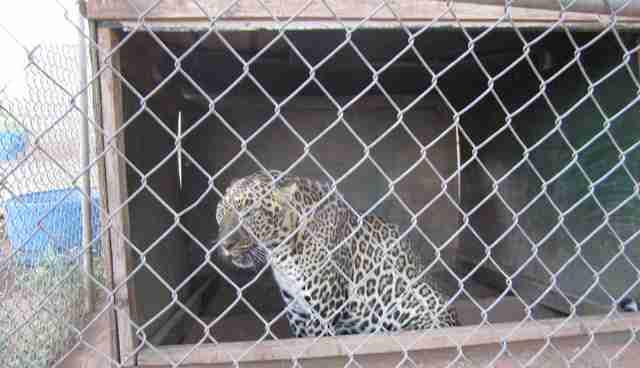 "We shouldn't be breeding these animals for private ownership or for entertainment." "When I first saw him, I was just afraid he was going to die," Searles said. "I wanted him to live so he could know what it's like to enjoy life because he never had before." "We try to make every day Christmas for him because his former life was so awful," she added. To help Southwest Wildlife continue its efforts to help Leonardo and other animals like him, you can donate here.